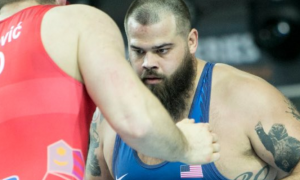 Two-time World medalist and Northern Michigan-Olympic Training Site assistant coach Andy Bisek is an excellent communicator. Although not known for being verbose or overly-outgoing, Bisek is one of those athletes who understands how to effectively get a point across without having to be long-winded about it. When you combine that quality with his ability to demonstrate a technique, you get a concise, efficient video like the one displayed below. 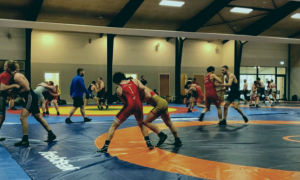 In this video, Bisek instructs how to put opponents off-balance, an especially useful skill given how the sport of Greco Roman wrestling is currently governed. With young star Kamal Bey (Sunkist) as his partner, Bisek applies pressure over the top of Bey’s underhook while maintaining workable position with his stance. This off-balance Greco technique is particularly important to guard against offensive maneuvers from your opponent such as high-dives, and it also puts you in great position to immediately counter. The off-balance Greco technique is equal parts arm-hands and lower body. Bisek maintains pressure the whole way with his hand near the scapula and stays heavy with his elbow over his opponent’s underhook. It is also critical to point out that Bisek’s footwork stays even and his stance is never compromised, which is another reason why this position can be effective against a wide range of different body types.